Posted on May 29, 2018 at 1:49 am. It’s time to keep your eyes on the ball. 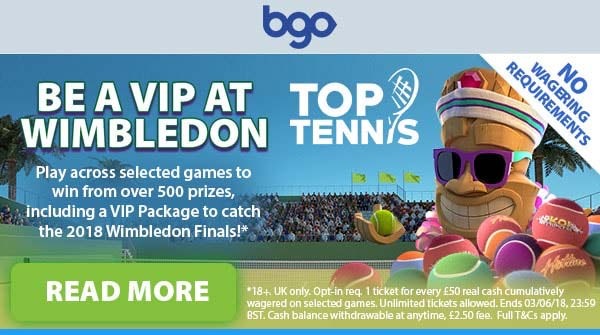 BGO Casino is giving away £6,500 in cash prizes, along with a VIP Package to see the 2018 Wimbledon finals. One lucky player and a guest could catch all the action of this famous sporting event in style, with centre court seats and access to a complimentary champagne bar. BGO will also cover the travel cost and a night of luxury at the boutique Zetter Townhouse Hotel in Marylebone. To participate, players simply need to opt-in and play across all eligible games (* See below) to collect 1 prize draw ticket for every £50 wagered until midnight on Sunday 3rd June. Over 500 lucky players will then be drawn to win from the prize stash. * Eligible games: Twin Spin Deluxe, Hotline, Archangels: Salavtion, Koi Princess and Jungle Spirit: Call of the Wild. This promotion is available on the BGO brand to UK players only.